Across all areas of the marketplace, consumers are demanding choice. More and more subscribe to the belief that what we buy reflects who we are. Food production is no different, and with this appetite for choice and transparency comes the need to select for animals that thrive under enhanced welfare conditions. Hendrix Genetics is excited to see one of our breeds acquire the 1-star quality mark from “Beter Leven”, the first from the turkey industry to achieve this standard. Quality labels such as the star rating system under the “Beter Leven” label (translated from Dutch as “Better Life”) allow consumers to choose food products that have been raised with specialized welfare standards in mind. Twan Jenniskens is a Dutch turkey farmer raising one of our alternative turkey breeds, known as the Cartier. A Dutch television program recently highlighted the farm and the role of Hendrix Genetics in this project. *To view the translated text in English, please enable the closed captioning (cc) function. The flock featured in this news clip are Cartier turkeys, an alternative breed for the European market. The Cartier birds are slow growing, feature bronze feathering, and offer a unique flavour profile. The alternative poultry breeding program is based in Brittany, France. 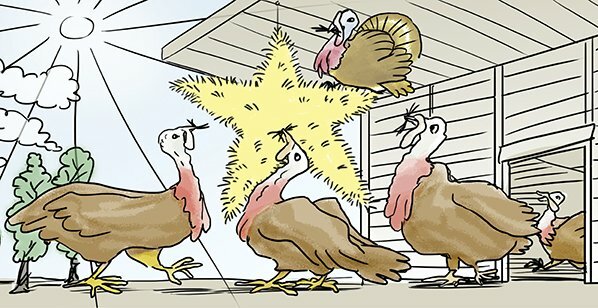 These turkeys are specially selected to thrive in the kind of environment optimal for the 1-star label, including outdoor access and increased space to move. Beter Leven is a rating system run by the Dutch Society for the Protection of Animals. This program designates a 1, 2 or 3 star system for meat production. It began a decade ago, when six poultry farmers gave their chickens more room and a covered outdoor space. This qualified them for the new certification. Since then, the program has grown to include over 800 farms and 31 million animals being raised under this standard. The criteria for certification include the conditions on the farm, the health of the animals, and how fast they grow. With our strong commitment to animal welfare, it became imperative that we work with this program. With the need for choice in the marketplace, and the importance of heightening animal welfare standards, Hendrix Genetics will continue to invest in offering products for a variety of environments. The next stage of this project with our partners from “Beter Leven” is to integrate blockchain technology in the system. As stated by Johan van Arendonk in the clip, increased transparency and focus on quality will mean the consumer can know even more about the food they eat and provide to their family.